Colca Canyon - Valley of wonders Colca's History That's what Peru's most famous author Mario Vargas Llosa called Colca Canyon and it's hard to disagree. Declared the deepest canyon in the world by the Guinness Book of Records in 1984, it's twice as deep as the Grand Canyon in Colorado and oh, let's say at least five times as interesting! It's not just the precipitous sides, lined with terraces and picturesque villages, or the crystal clear waters of the Rio Colca in the valley 3,400m below; it's not even the Andean Condors in the air or the herds of wild vicuñas on the slopes; even the natural hot springs wouldn't be enough on their own to get you to travel all this way; it's just that when you put them all together and then put them within reach of a gorgeous city like Arequipa, you start to realise that Colca Canyon isn't just a wonder, it's simply unmissable. Colca Canyon is the canyon of the Colca River in southern Peru. It is located about 100 miles (160 kilometers) northwest of Arequipa. The Colca River starts high in the Andes at Condorama Crucero Alto and changes its name to Majes, and then to Camana before reaching the Pacific Ocean. Colca Canyon is one of the deepest canyons in the world at 10,725 ft (3,269 meters), it is more than twice as deep as the Grand Canyon in the United States. However, the canyon's walls are not as vertical as the ones of the Grand Canyon. The Cotahuasi Canyon nearby to the northwest is a deeper canyon at 11,488 ft (3,501 meters). Since they are such major features of the landscape, the Colca and Cotahuasi canyon. The Colca Valley is approximately 160 kilometers from Arequipa. The main town, Chivay, can be reached in a memorable trip of less than three hours. After spending the night in Chivay, one should descend to the river as early as possible. Passing through the towns of Yanque, Achona, Maca and Pinchollo, one arrives at La Cruz del Cóndor, an observation point offering a spectacular view of the canyon. Without a doubt, the most interesting towns are Maca, Yanque, Lari and Coporaque. Coporaque contains the oldest church of the 17th century and was once the site of a copper palace built for one of the wives of the Inca Mayta Capac. After the conquest, the metal was used for horseshoes, and then with the arrival of Catholic clergy, it was melted down and recast as a bell. Many of the temples of the area are of remarkable architectural quality. The Church of Yanque, the base for all the Franciscan missionaries of the valley, is one of the most important Mestizo-style monuments. 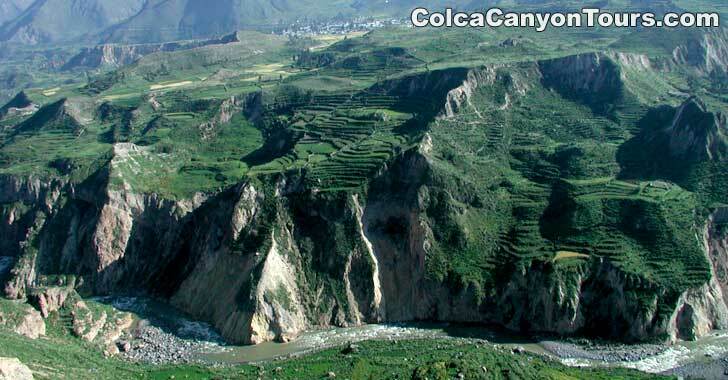 More information about Colca Canyon, visit Colca tours.